My post today, is coming to you a bit late since my little ones are sick. Not the best week, but we will get through it. Sandy offers a freebie on the site and a full range of other amazing images that you can purchase from the store, HERE. Here is my sample for this months challenge. I am using Mr. Wool Shamrock. Isn't he adorable? So I just outlined him and colored his balloon clovers with Copics. Bugaboo Stamps is our sponsor this month and the sentiment you see there comes from HERE. I used some Echo Park paper and green pearls to finish the card. So I hope that you will join us this month. There is a freebie on the site, so come by, join us and play with us. Very adorable! Love the ewe! Thanks for playing along at Twisted Tuesday challenges! Your card is soooo cute! Love the curl on the banner and the image is adorable! Thank you for playing along with us at Twisted Tuesday Challenges. Very cute project! Thanks for playing along with us at Crafter's Cafe Challenge Blog! This is fun!! So glad you shared with us this month at The Crafter's Cafe Challenge Blog! Hope to see you again soon! 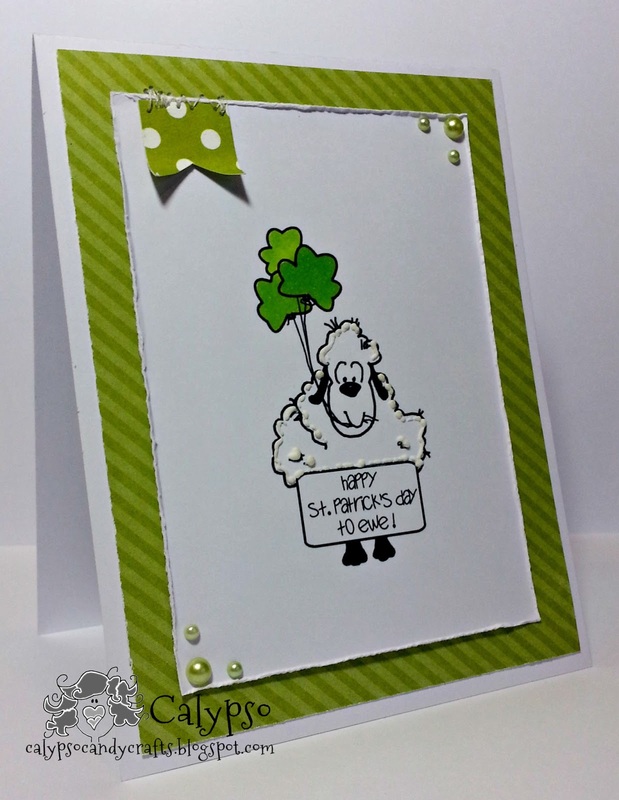 Very cute card--perfect for St. Patrick's Day! Thanks for playing in the Critter Sketch Color Challenge. Very cute. I love the dimensional aspect around the lamb. Thanks for joining us at Twisted Tuesday Challenges. Super cute card! I love that shade of green. Thanks, for joining the challenge at Twisted Tuesday Challenges!